You can wear this necklace 3 different ways which makes it very versatile. This necklace can be worn with or without the CZ drop in the middle. All sterling silver and the shoe is hand made. This can also be worn with a drop pendant that you all ready have. You can purchase this as a set for a steal. 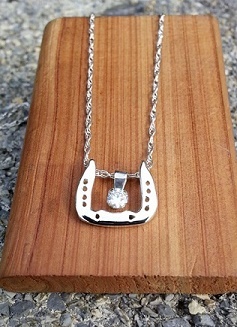 Dimension: Horseshoe 1/2 inch by 3/8 inch, Chain is 18" Rope, CZ drop is set in Sterling Silver.